Leverage is a great tool of modern finance that can be used to amplify one's annual returns relative to actual cash invested. In real estate investing, this ratio is known as the cash-on-cash return, which is expressed as a percentage that increases as the down payment decreases. So the greater the debt on a property (called loan-to-value ratio, or LTV), the greater the projected return for investors. That's all well and good during an up market, but one need look no further than the crash of 2008 to see what happens to over-levered real estate when the market stalls and speculation ceases. Unfortunately, many investors have short memories and so assume the party will never end. The Farm Crisis of 1985-1987 was amplified by large amounts of leverage (mortgaged debt) in the system, as farm price appreciation of the early 1980s drove heavy amounts of investment from speculating farmers that placed large amounts of leverage on their farms. When prices began to go down, this set into motion a spiral of defaults, forced resales, and lower prices. 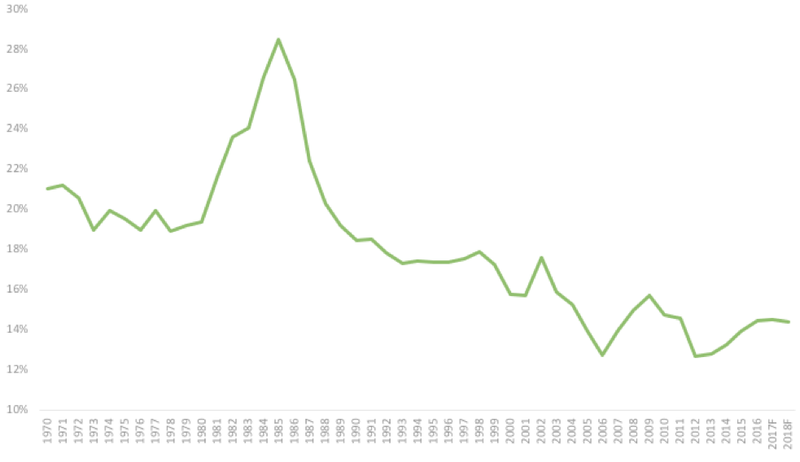 Debt-to-equity leverage ratios peaked in 1985 at nearly 29%. Most farmers currently operating still remember the 1980s crash, and it's a lesson they have not forgotten. Compare that figure from 1985 with today, where the USDA estimates leverage at a near-record low of 14%. 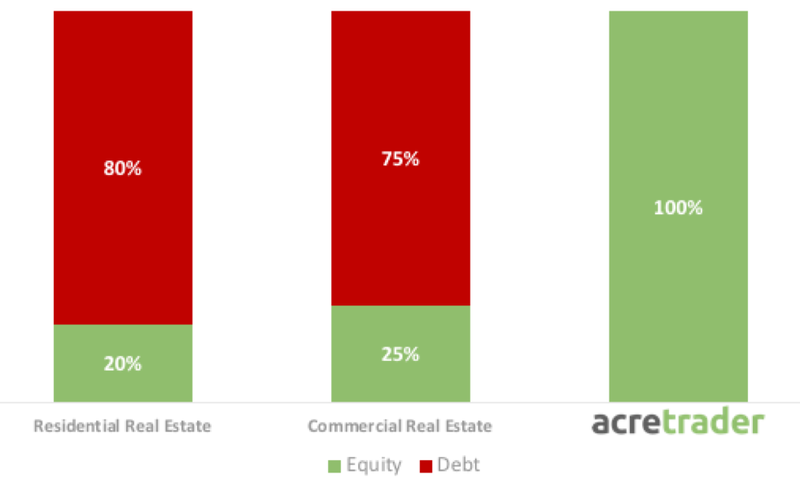 This small amount of leverage, or total debt, involved in farmland makes the return profile even more impressive when compared to other assets like commercial real estate. 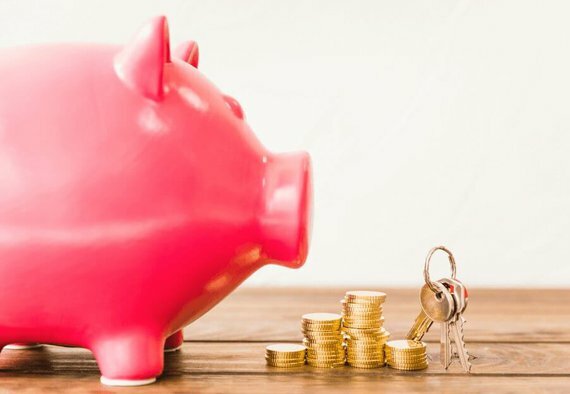 While debt can often help amplify returns for real estate investors, as mentioned at the beginning of this article, it also greatly increases the risk. For example, if you buy a retail center with a 20% down payment, the other 80% is covered by debt from the bank. Using leverage, if the value of the property goes down by 20%, the value of your investment becomes zero. Not only that, you still owe the bank the other 80% along with its associated monthly carrying costs. Unlike most real estate investments, typical plots of U.S. farmland have little or no debt on them. Typical properties on AcreTrader have no debt on them either. That is to say they are unlevered, meaning investors own 100% of the subject property without the involvement of banks or significant debt. Unlevered real estate therefore carries a much lower relative risk, which you can learn more about in the article Mitigating Risk in Farmland Investments. This is also something to consider when exploring other real estate crowdfunding options. Note: The information above is not intended as investment advice. Data in the charts above is through year end 2017 and is sourced from Bloomberg and NCREIF, with additional calculations and analysis performed by AcreTrader. Past performance is no guarantee of future results. For additional risk disclosures regarding farmland investing and the risks of investing on AcreTrader, please see individual farm offering pages as well as our terms and disclosures.